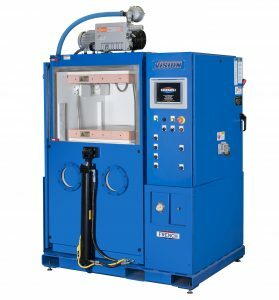 Our new compact Vision® Vacuum Hydraulic Press offers a compact yet rugged design, and low deflection in a package designed to enhance production. Building on the success of our VISION Series modular self-contained hydraulic laboratory presses, French has introduced a new Vision Vacuum Hydraulic Press that combines many of the innovative features of our VISION Series hydraulic presses with the rugged low-deflection sideplate press clamp design typically found on larger tonnage presses. Available in 30 to 150 ton models, these vacuum presses are suited to a wide range of applications and materials. 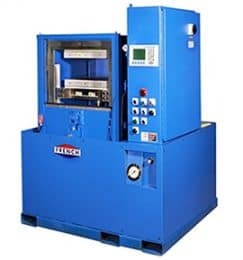 French is known for its rugged, low-deflection production hydraulic press designs, and the compact Vision Vacuum Hydraulic Press is no exception. It’s temperature compensated, gib guided sideplate press design offers low deflection in a compact press package that is fully self-contained in a small footprint. The vacuum clamp, power unit and controls are all within a common press frame. The hinged rear door and sliding front door have easily replaceable seals and the sliding front door has an interlocking tape switch. This design allows greater tool flexibility than a box-type or vacuum shroud vacuum chamber design. The design also provides a solution for molding critical or difficult parts; especially highly gaseous materials and parts with deep-drawn profiles. French knows that customers understand that features are especially valuable when they can increase production performance – our compact Vision Vacuum Hydraulic Press delivers. Cycle time is reduced through reduction or elimination of bump sequences and scrap rate is reduced by eliminating surface imperfections and voids. The large vacuum port allows for a fast vacuum rate. 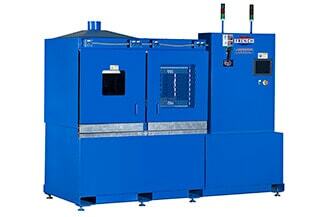 The Bottom Line: our compact Vision Vacuum Hydraulic Press helps you lower production costs.